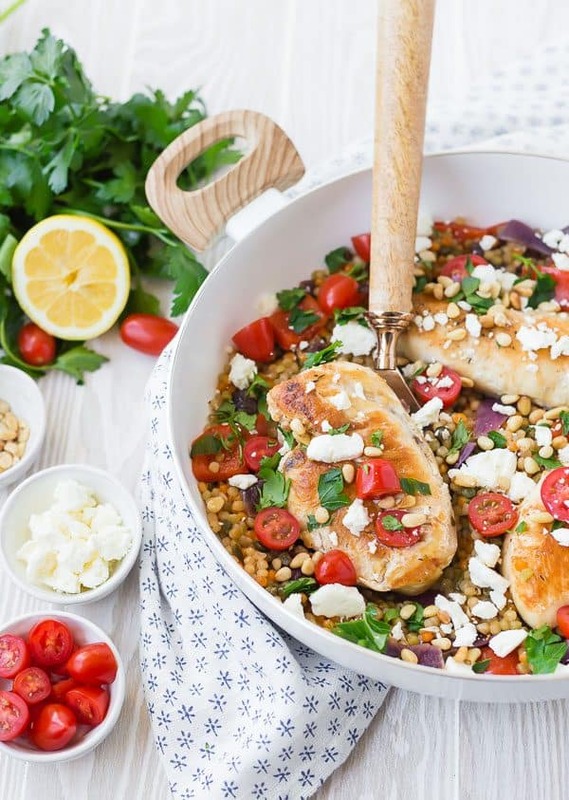 This One Pan Mediterranean Chicken and Israeli Couscous is a complete meal made in one pan. The flavors are bright and flavorful, and it’s going to become one of your go-to recipes! I am super excited about to share this recipe with you guys! I feel like I’ve been saying that about a lot of my recipes lately, like the vegan tacos I couldn’t stop talking about…but this really is another great one. Don’t get me wrong, I’m always excited to share recipes but some are just a little more exciting than others. I use my recipes for Instant Pot Boiled Eggs and homemade taco seasoning (and countless other basic, staple recipes) ALL the time, but they’re just not quite as fun as recipes like this one. There really isn’t a type of recipe that I enjoy creating more than a one pan meal recipe. Whether it be Instant Pot, sheet pan, one pan pastas, one pan skillet meals, or slow cooker recipes, I love a good recipe that doesn’t make a lot of dishes dirty. What can I say…I don’t like doing dishes, and I don’t know many people who do. 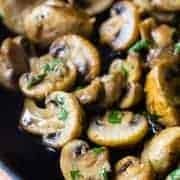 I enjoy creating recipes that I like making myself for family dinner on a Tuesday or Wednesday (or any day) evening, when I’m tired and worn out. Because I know you guys have the same kind of nights. 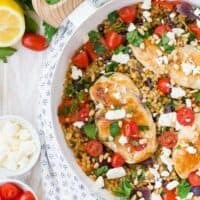 I love this recipe in particular because it has protein, vegetables, and pasta, all in one pan. And the flavors are out of this world. Savory onions, peppers, and garlic lay the foundation for this recipe. You’ll want to make sure to brown the chicken nicely to lock in that great flavor – it also make it more visually appealing. 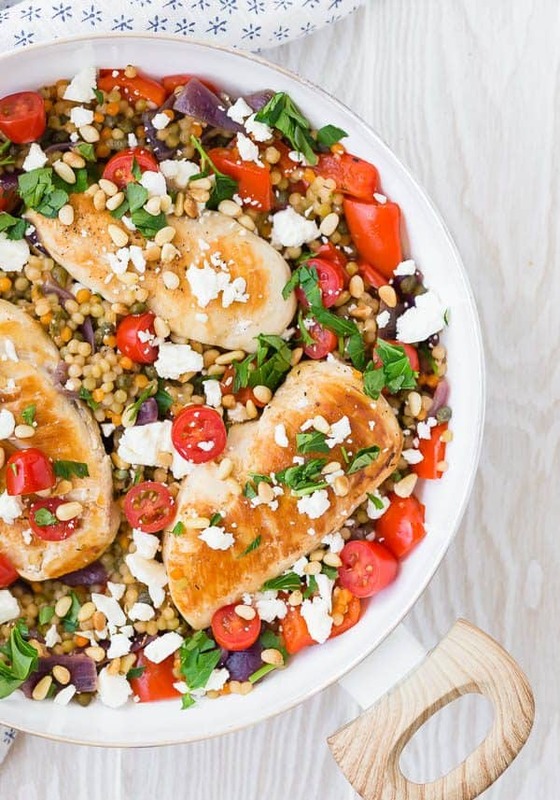 The Israeli couscous is cooked in a flavorful chicken broth with oregano and thyme mixed in. WHAT IS ISRAELI COUSCOUS? I realize Israeli Couscous might be a new ingredient for some of you. You may also find it labeled or referred to as “pearl couscous.” It’s basically a larger size of the couscous you may be more familiar with. It’s a variety of pasta…and it’s pretty fun to eat! A squeeze of fresh lemon juice when it’s done cooking makes sure this recipe has the perfect touch of acidity and brightens up all the flavors. And then there are the toppings. It’s no secret around these parts that I’m a toppings girl. I went crazy with toppings on this recipe and added fresh diced tomatoes, creamy crumbled feta, toasted pine nuts (read how to toast pine nuts), and fresh parsley. I wouldn’t recommend skipping any of them, but as always (almost always), toppings are sorta-kinda-if-you-have-to optional. Speaking of toppings…. Side note about nuts: Yes, my kids are allergic to nuts. 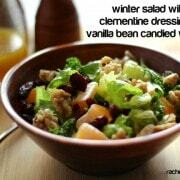 Occasionally you will see recipes with nuts here on Rachel Cooks, when I think they’re a great fit for a recipe. Just because I can’t eat them on a regular basis because my kids are allergic (so sad!!! ), doesn’t mean you shouldn’t be able to if you don’t have a family member with an allergy. With the original testing, I tested this recipe with pine nuts because I adore the flavor of them and knew they would benefit this recipe substantially. I use EXTREME caution when working with nuts in my home (in fact, you won’t see many recipes that use peanut butter or other nut butters, because it’s just too sticky and hard to clean up), and my kids are only allergic through ingestion. After initial testing, we obviously don’t add the nuts to the recipe. Which is also sad because I could eat pine nuts by the handful, but it’s what we have to do. Whole30 Chicken Thighs – a complete sheet pan dinner! I have so many more where those came from! Use the search box on my site and search “one pan” to find them! 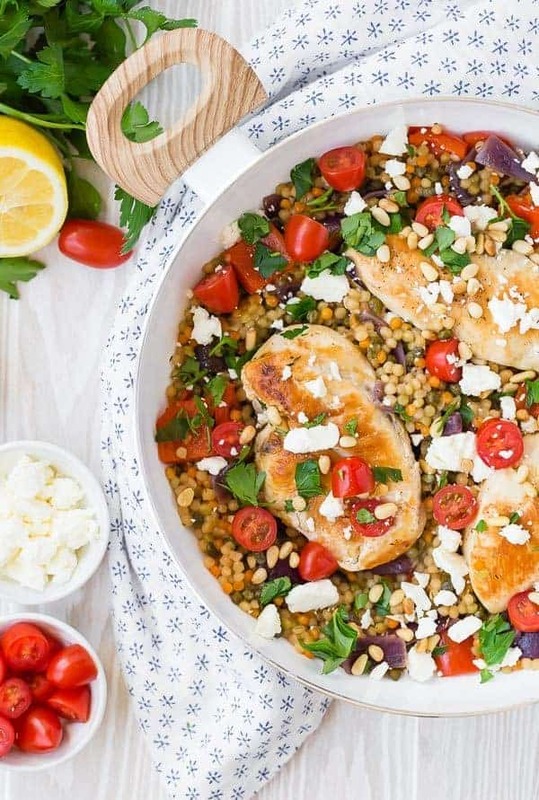 This One Pan Mediterranean Chicken and Israeli Couscous is a complete meal made in one pan. The flavors are bright and flavorful, and it's going to become one of your go-to recipes! In a large, deep skillet (with a cover available for later), heat olive oil over medium-high heat. When oil is hot, add chicken, and sprinkle with pepper and 1/2 teaspoon of salt, and cook and brown for 4 minutes on each side. Push chicken to the side, reduce heat to medium, and add peppers and onions. Sprinkle peppers and onions with 1/4 teaspoon salt, oregano, and thyme. Cook for another 4 minutes, stirring frequently. Add garlic and cook until fragrant, stirring, about 1 minute. Add couscous, capers, and broth. Stir to combine and increase heat to medium-high. Try to ensure that no couscous is stuck to the edges of the pan, and that it is submerged in chicken broth. Bring to boil, nestle chicken into couscous mixture, and cover. 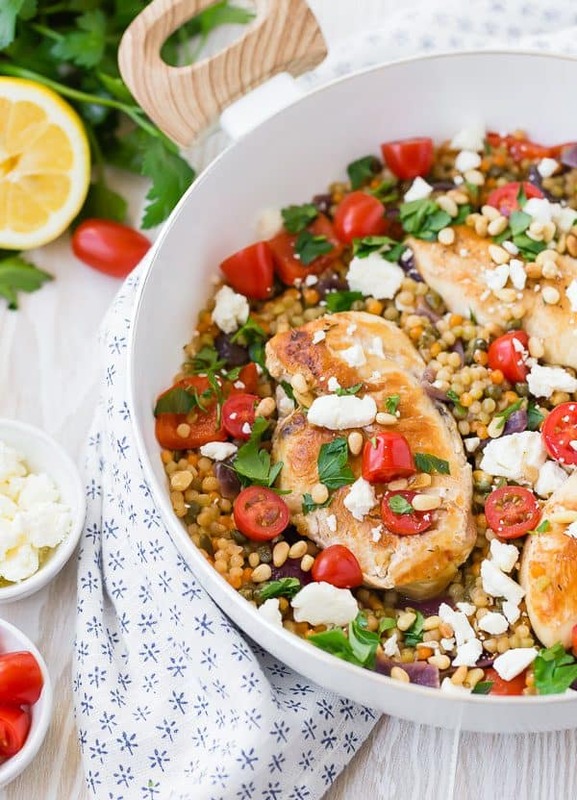 Reduce heat to medium (should be a low boil) and cook for 8-10 minutes or until couscous is tender and chicken is cooked through (should read 165ºF on an instant read thermometer). Pour lemon juice over chicken and couscous. 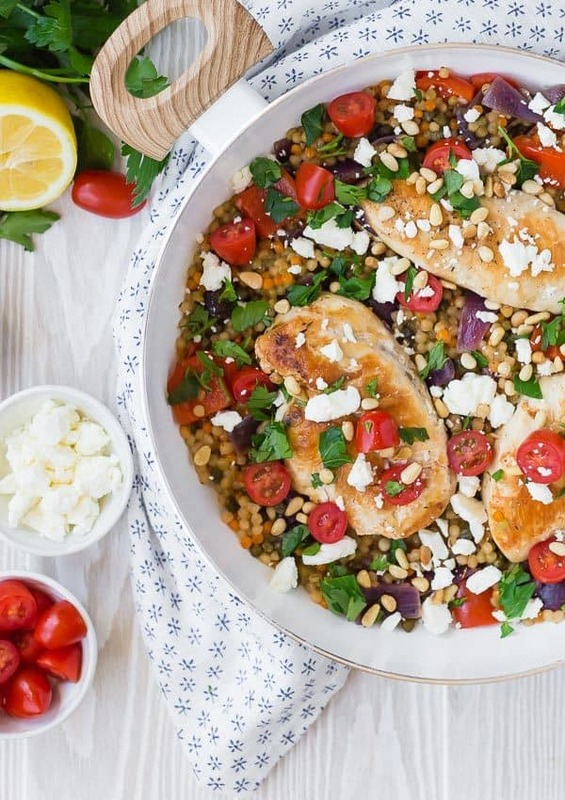 Serve garnished with tomatoes, feta, pine nuts, and parsley. Topping measurements are flexible. You can add as many or as few toppings as you’d like. 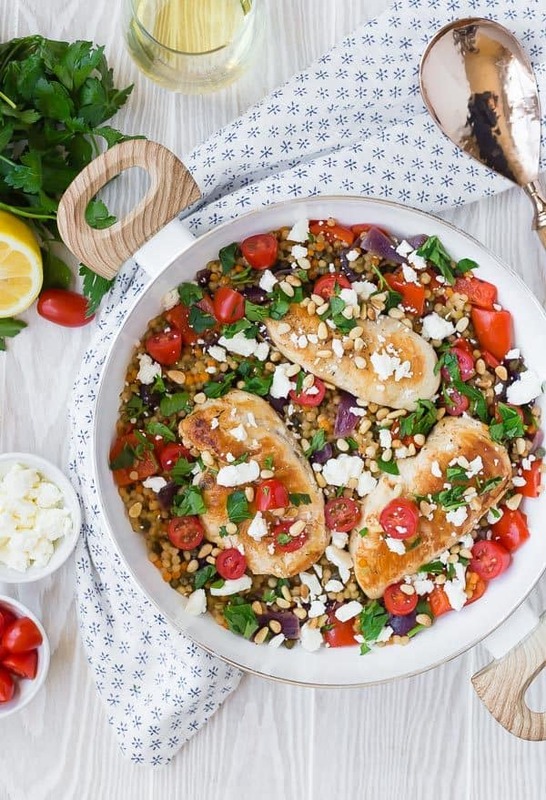 I like to use block feta cheese (not the kind you buy already crumbled) for this recipe and crumble it myself. 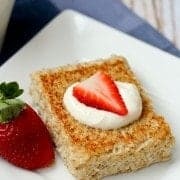 It’s much creamier and more flavorful. If you like olives in this recipe, try substituting some sliced kalamata olives for the capers. They’ll add great flavor and color to this recipe. Verdict: I absolutely love everything about this recipe. Except sometimes the Israeli couscous gets stuck between the tines of your fork and it’s mildly irritating, but it’s worth it. Husband’s take: To my pleasant surprise, Ben loved this one! I thought it might have too much going on for him, but I underestimated him. Changes I would make: None at all are necessary!